With Aluwind’s annual delivery of internals for over 2,000 wind turbine towers, we are the world’s leading supplier of tower internals. We produce a wide range of internals at our own factories and deliver them as individual components, part assemblies or along with purchased items in complete kits with all components ready for tower mounting. The completed deliveries of tower internal kits come from our supply centres which operate as an extension of our production. Our supply centres are specialists in purchase and handle components and supply of the total solution to the tower producer as complete and timely deliveries. In addition to supplying internals, we offer pre-mounting and on-site mounting at the client’s location. 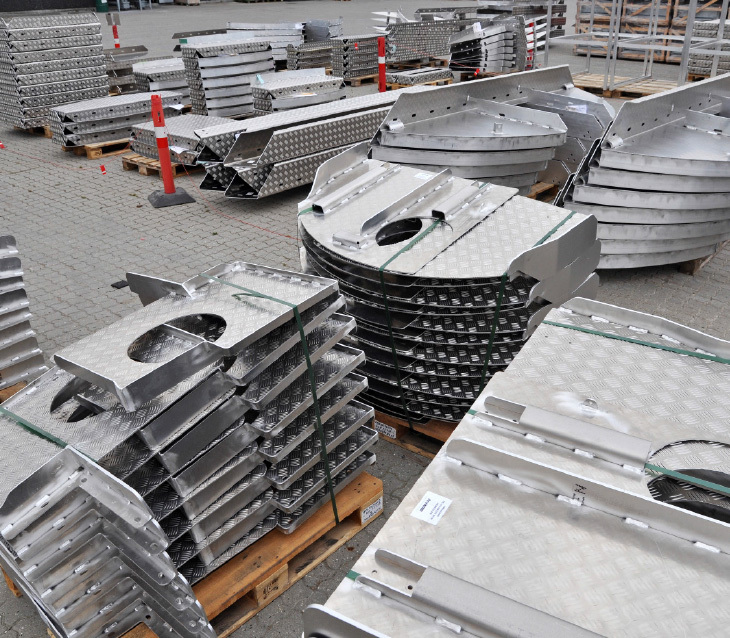 Aluwind also offer production of site parts such as access staircases and platforms. In addition, we offer our clients to handle other parts and finish the overall site parts kits to be ready for shipment to the wind turbine site. This enables our clients to handle an individual part number which includes all individual components to be mounted on the site. This leads to substantial simplification and savings.